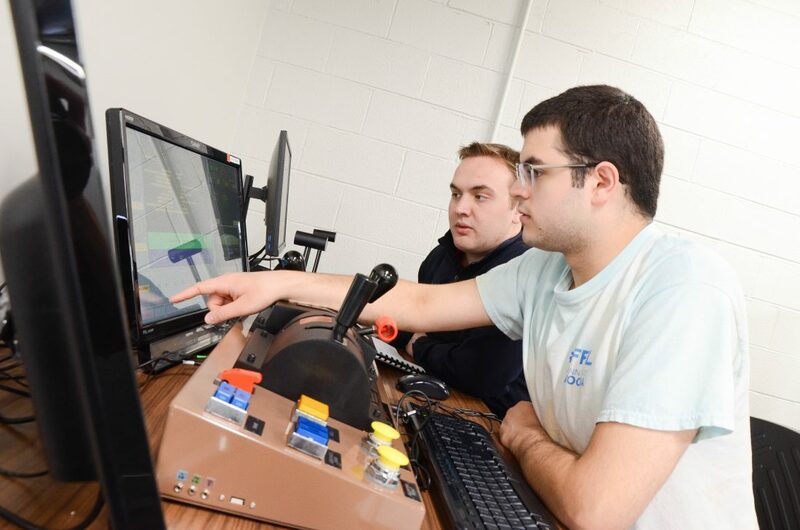 Art submitted by Marissa Carney / J. Michael Yohn (left) and Michael Kozik, both third-year rail transportation engineering students at Penn State Altoona, work through a positive train control prime module using the locomotive simulator donated by PS Technology. Rail transportation companies nationwide have spent billions of dollars and are almost finished implementing advanced safety systems mandated by Congress to prevent train accidents. By 2020, positive train control will be ready across the nation. Penn State Altoona is preparing its Rail Transportation Engineering program students to take charge of maintaining the system and fixing its glitches. The campus received a new $104,000 positive train control simulator from PS Technology. The company provides software to the largest railroads in North America. “It’s one step away from actually using the system in the cab of a locomotive,” Schlake said. Penn State Altoona offers the only bachelor’s degree in rail transportation engineering in the country. It started in 2011. It’s graduates have a 100 percent job placement, Schlake said. And the current crop of students will graduate into a new kind of railroad equipped with positive train control, a GPS-based system. “By the time they graduate, it will be the law of the land,” Schlake said. Congress passed a 2008 law mandating PTC implementation after a head-on rail crash that killed 27 in Chatsworth, Calif., caused by an engineer’s failure to notice a stop signal. Positive train control would recognize problematic situations like that one or going too fast into a curve or toward a misaligned switch and apply the brakes automatically. A 2015 deadline was set originally for all railroads to have PTC protection, but U.S. Rep. Bill Shuster was integral in extending that deadline. Norfolk Southern has invested in it and locations where it is testing it. Union Pacific has invested $2.8 billion through 2018 in PTC, and plans to spend $115 million in 2019, according to its website. With a simulation conducted through two computer screens on a desktop, Penn State Altoona students see what the engineer is doing and how the parts of the PTC system connect. While the students are not on a path to be railroad conductors, they may go out and supervise them or design signal systems. Schlake said they need to be exposed to every aspect of operating the PTC system. There are 32 students in Penn State Altoona’s Rail Transportation Engin­eering program from as far as Kansas and New York, Shlake said. The more traditional path to becoming a rail engineer has been for companies to hire people with other types of engineering degrees and provide further education in the workplace. Penn State Altoona students also may go through that step once they are hired, but they are prequalified. Every student graduating receives multiple job offers, Schlake said. “We’ve estimated 30 to 50 entry level job openings across the country for every one of our graduates,” he said.